The FDIC (Federal Deposit Insurance Corp) issued their quarterly report on Tuesday. It's safe to say that the information that was contained in the report didn't do too much to calm the nerves of Americans who are still worried about the stability of the banking system. To start with, the FDIC insurance fund has fallen into the red for the first time since the S&L crisis of the early '90s. This was not unexpected news, but many people surely didn't like hearing about how the fund had a negative balance of $8.2 billion dollars at the end of the third quarter. The FDIC is dealing with this deficit by having banks prepay their annual assessments (through 2012). This move is expected to add approximately $45 billion dollars to the insurance fund. 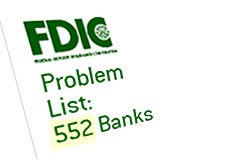 In addition to this lovely piece of news, the FDIC also announced that there are currently 552 banks on the "problem bank list", up from 416 in Q2. "Problem banks" are banks and thrifts that are determined to be in "poor" shape by regulators. Every 12-18 months, every bank and thrift in the United States is thoroughly audited by government examiners. These examiners determine the overall strength of the bank by looking at a number of different factors, including: cash on hand, delinquent loans, etc. The examiners then compile their findings and give the bank a grade of between 1-5, with 1 being the best and 5 being the worst. If a bank has a score of 4 or worse, then they will find themselves on the "problem bank list". These banks will then be told that they must resolve their issues or face the possibility of being taken over by the FDIC. The banks that are included on the "problem bank list" are kept a secret, as the government doesn't want people pulling their money from these troubled banks. If that happened, then these already shaky banking institutions would surely go under. A bank doesn't necessarily have to appear on the "problem bank list" prior to failing, and a bank that appears on the "problem bank list" isn't necessarily going to fail. Inclusion on the "problem bank list" is simply the government's way of saying "Get your act in gear and fix these problems." The 552 banks and thrifts included on the Q3 "problem bank list" is the highest such number in 16 years. More bank failures in 2010 - many more. We'll probably end up with around 150 failures in 2009.. I wouldn't be surprised to see the same amount, if not more, in 2010. More bank failures will mean more of a strain on the FDIC's insurance fund. The FDIC, as mentioned, will have about $45 billion in fresh capital coming in soon via the prepaid annual assessments. The obvious question is - what happens if the number of bank failures remains high over the next few years, and the $45 billion evaporates? The FDIC does have a massive line of credit with the Treasury, but they have been loathe to tap it.